Known as the birthplace of photography, Chalon-sur-Saône is a scenic town with a rich history. 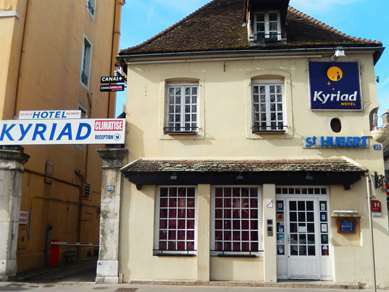 Come and discover Burgundy by staying at a Kyriad hotel nearby. Located in east-central France, Chalon-sur-Saône sits on the Saône River, a tributary of the Rhône. With a population of about 50,000, it is the largest town in the Saône-et-Loire department of France’s Burgundy region. First established 3000 years ago, Chalon-sur-Saône has an illustrious past. The town was part of the Roman Empire, before falling under Episcopalian rule. The Bishopric of Chalon-sur-Saône had its seat at Saint Vincent’s Cathedral, within walking distance of the Kyriad Chalon-sur-Saône Centre Hotel. Chalon-sur-Saône is also home to major figures in French history. Nicéphore Niépce was an inventor who lived in the town during the 18th and 19th centuries. He is credited with producing the world’s first known photograph and also created the first internal combustion engine. In 1818, Niépce created the “velocipede” (dandy-horse), a precursor to the bicycle. Dominique Vivant Denon, another well-known resident of the town, helped transform the royal palace in Paris into the modern-day Louvre Museum.